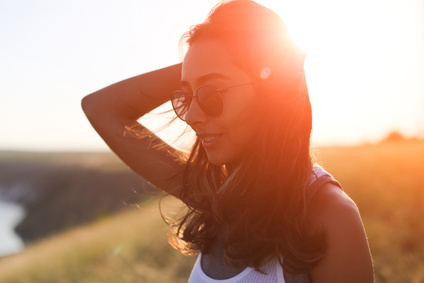 While you’re having fun in the sun this summer, spare a thought for what it might be doing to your hair or come winter, you’ll be needing some hair rehab to bring it back to health. UV rays, heated styling tools, salt water, wind and chlorine can all damage your hair. Here, we’ve provided some helpful tips for protecting your hair from the environment and too much hair styling, during the summer. Whether it’s UV rays from the sun, or overuse of a curling iron or curling wand during party season – when it comes to hair care, heat is not your friend and is your hair’s worst enemy. So when going out in the sun, wear a hat and pour a drop of sunscreen in your hands and run it through your hair before taking a dip in the ocean or pool. There are also lots of different hair care products you can try which will provide your hair with some much needed UV protection. 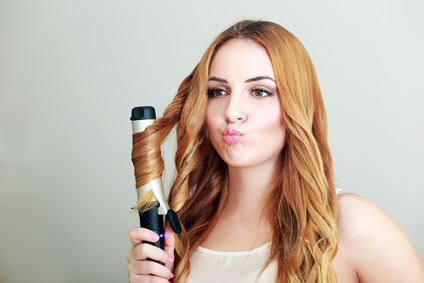 As summer is the party season, you’ll more than likely be using your curling iron or curling wand much more than usual and that can be a real problem for your hair. Protect those curls by applying a protective cream or spray before using a curling iron or wand. As much as possible, avoid blow drying your hair during the summer months and if you do have to blow dry it, turn down the heat and apply a heat-protection spray or serum beforehand. Swimming in salt or chlorinated water can strip your hair of their natural oils, leaving it dry, frizzy and brittle. While an occasional dip will dry your hair out for a day or two, it won’t cause any lasting damage. But if you are a regular swimmer, one of the best ways to protect your hair from chlorinated water is to wear a cap. Another useful trick is to saturate your hair with fresh water before entering the pool. Running your hair under fresh water will also protect your hair from the damage caused by salt water. Don’t forget to run fresh water through your hair again after swimming and wash your hair with shampoo to remove any chlorine or salt water. If you ask a group of women what’s their biggest concern in relation to hair care, most of them would say “split ends”. Split ends are caused by excessive heat, excessive friction from wind or blowing drying your hair, brushing hair when wet, chemicals from hair dyes and swimming in chlorine. All these weaken the protective cuticle that surrounds the hair fibre and when enough stress is put on the cuticle, it loses its grip on the inner fibre and the ends fray into two or more strands. Thick hair is more likely to fray than fine hair because the structure of thick hair is less flexible, making it more vulnerable to breakage. So now we know what causes it, how do we prevent split ends? Firstly, limit your use of hair dyes and heated styling tools because chemicals and heat puts the delicate hair fibres under stress, making it prone to breakage. Secondly, your hair is most vulnerable to breakage when it’s wet, so never brush your hair when it’s wet, use a wide-tooth comb instead. Thirdly, use a fortifying leave-in conditioner that seals ends that are already fraying and protects against heat damage. Lastly, get regularly trims as chopping off just 5 to 10 millimetres every 8 weeks or so, will prevent damaged ends from splitting up the hair shaft.